Being won over by the previously explained bhagavAn‘s greatness came about from his true nature, his wealth/control which came about from his inseparable relationship with ubhaya vibhUthi (paramapadham (spiritual realm) and samsAram (material realm)), his simplicity which came about from his great qualities, ALavandhAr meditates upon the greatness of bhagavAn who is the refuge, as done by SvEtha dhvIpa vAsis (residents of SvEtha dhvIpam) in jithanthE sthOthram 1 “jithanthE” (Let him be victorious), as done by arjuna in SrI bhagavath gIthA “nama: purasthAdhatha prushtathasthE” (I bow down to you, in front of you and behind you) and as done by nammAzhwAr in thiruvAimozhi 1.3.4 “yArum Or nilaimaiyan” (anyone to know him that he in “such and such manner”). Also explained as – Having previously explained the nature of the goal, here the nature of the person who pursues that goal is explained. Another explanation – Having previously explained the nature of bhagavAn, the refuge, here he highlights the nature of SaraNAgathi (the process of surrender) which is going to be explained subsequently. namO nama: – namaskAram (salutation). My namaskAram, namaskAram (salutations! salutations!) to you who is beyond the reach of the speech and mind (of those who try to know you by their own efforts); my namaskAram (salutation) to you who is within the reach of the speech and mind (of those who have known you, by your grace); my namaskAram (salutation) to you who have boundless great wealth; my namaskAram (salutation) to you who is an ocean of mercy. avidhyAtharusambhUthibIjamEthath dhvividhA sthithtam ||” (Considering that which is not AthmA (i.e., body) as AthmA and considering that which is not one’s property (i.e., AthmA and that which is owned by the AthmA which are fully owned by bhagavAn) as one’s own are the two seeds for this tree of samsAram (which is the cycle of birth and death based on one’s actions). Here ahankAram is considering the AthmA as body – dhEhAthma abhimAnam. mamakAram is considering oneself as the owner – sva svAthanthriyam). “ahamapi na mama | bhagavatha EvAhamasmi ithyEvam amamathAm yOjayathyathO nam ithi” (nama: is said to be the bestower of the thinking “I am not for me; I am a servitor of bhagavAn”). mahAbhAratham SAnthi parvam13.4 “dhvayaksharasthu bhavEnmruthyus thryaksharam brahmaNa: padham |” (two lettered word “mama” (mine) leads to material realm; three lettered word “na mama” (not mine) leads to eternal liberation) and so on. Since “nama:” is synonymous to SaraNAgathi, it also highlights that. Repetition of “nama:” is due to being captivated with its meaning. thaiththirIya AraNyaka 4 “sakruththE agnE nama: | dhvishthE nama: | thristhE nama: | chathusthE nama: | panchakruthvasthE nama: | dhaSakruthvasthE nama: | SathakruthvasthE nama: | AsahasrakruthvasthE nama: | aparimithakruthvasthE nama: ||” (Oh agni (presiding deity for fire)! I salute you once; twice; thrice; four times; five times; ten times; hundred times; upto thousand times; countless times). vAngmanasaika bhUmayE nama: – For you who is within the reach the speech and mind of those who know you by your grace. SrI bhagavath gIthA 10.5 “bhavanthi bhAvA bhUthAnAm maththa Eva pruthagvidhA:” (The gyAnam etc of the creatures occur due to my sankalpam (divine will) only) and so on. anantha mahA vibhUthayE – For you who is the lord of the two immeasurable vibhUthis (realms/wealth). You are beyond the reach of speech and mind because you are the lord of the immeasurable wealth. anantha dhayaika SindhavE – For you who is an ocean of immeasurable mercy which makes you within the reach of speech and mind. 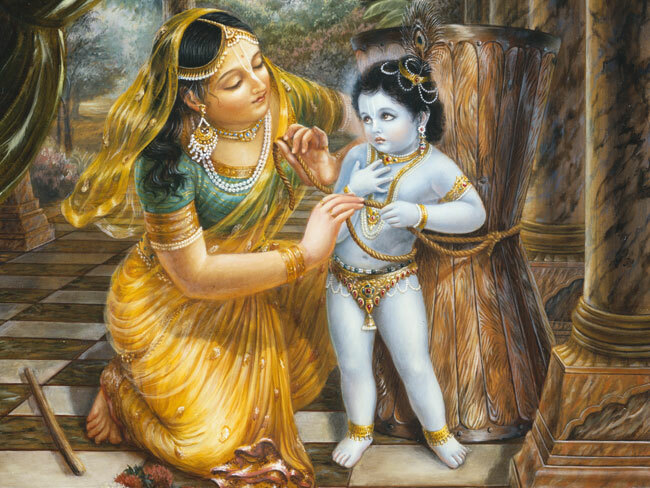 You mercy’s infinite nature is such that you who is omnipotent, is understood/controlled by a cowherd girl as said in SrIvishNu purANam 5.6.14 “… yadhi SaknOshi gachcha thvam …” (yaSOdhA tied the mischievous krishNa into a mortar with a rope and angrily told him “Oh one with mischievous activities! if you are capable, free yourself and go now”). This entry was posted in Other, sthOthra rathnam on January 3, 2017 by Sarathy Thothathri.